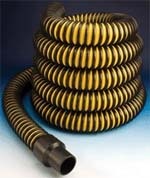 These products have a smooth interior and are all-plastic flexible hoses handling a full vacuum (Depending on the I.D. )Hosexpress is known for industrial and commercial vacuum hose applications. A full-line of cuffs and connectors are available for the product line.